Grassless front yards aren’t seen only in the City of Buffalo. 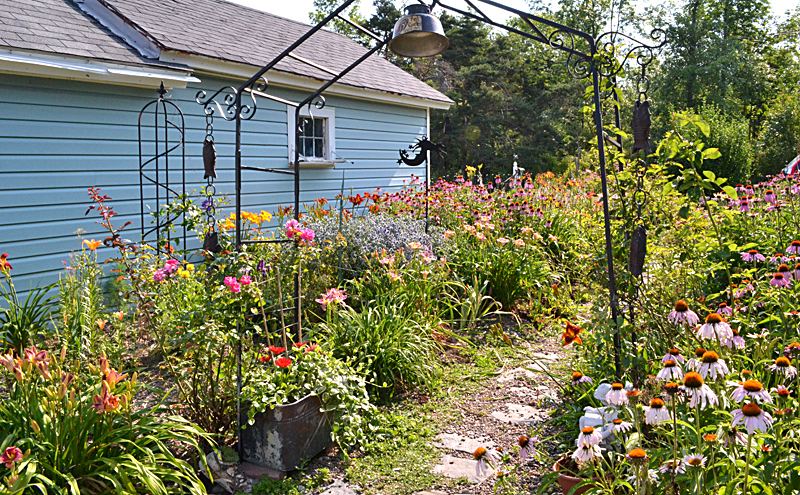 A profusion of flowers fills most of Catherine Klein’s front yard in a semi-rural area of Clarence. As you’re planning your garden for this summer, take inspiration and some tips from Catherine. Catherine and I are related. Her father-in-law and my late father were cousins, which makes me and Catherine second cousins by marriage (or something). I took these photos in July 2012 when my sister and I stopped over at Catherine’s house. Catherine’s gardens extend along the side of the house and into the huge backyard on their one-acre lot. Above left is a path lined with flowers that runs between the house and the garage. This view faces the street. She didn’t get these gardens all at once. It has taken more than a decade to create these wonderful garden beds. She claims that her husband Greg didn’t want anything to do with gardening and dug up just a small strip for her to use as a garden. “Every year I would take a shovel and go a little further and little further and a little further,” she said. As you can guess from the extent of the gardens, these day-long digging sessions happened more than once. Tip: Catherine emphasizes the need for good soil. The handmade Amish fence seen above is practical as well as decorative. Cars sometimes speed down Strickler Road, even reaching 100 miles per hour, and Catherine was afraid that one might some day crash into the house. The wrought iron fence adds some protection. One of the plants along the fence can be seen at right. 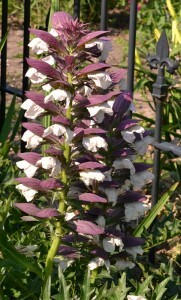 It’s called bear’s breeches and is a heritage or heirloom plant. Heirloom plants are varieties that were grown before widespread hybridization. Catherine’s gardens are established now, so she doesn’t spend a lot of time maintaining them. “If it’s two hours a week, that’s a lot,” she said. Many of her perennials are low-maintenance choices such as day lilies, which are drought resistant. She groups many fragrant Asiatic lilies near the window where she can enjoy the perfume from the garden. You can get a glimpse below. While I photographed her gardens in July, that’s not the only time she has flowers. 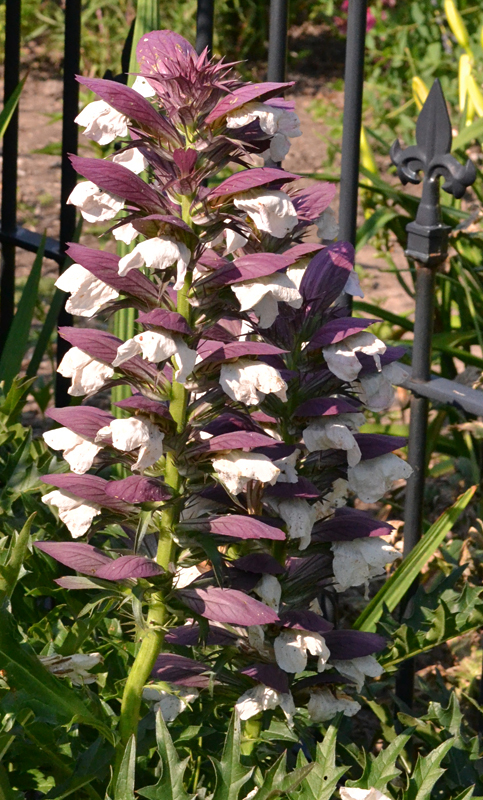 Her gardens start blooming in early March with Lenten roses and continue blooming through November. “I just wake up every morning and get a different present each day because something new is blooming,” Catherine said. 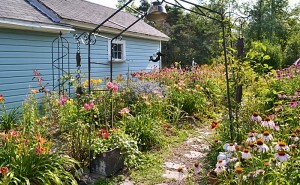 She tries to keep her garden as natural as possible, and you’ll see wildflowers among her cultivated varieties. She makes sure she has water available for birds and butterflies and doesn’t use insecticides. 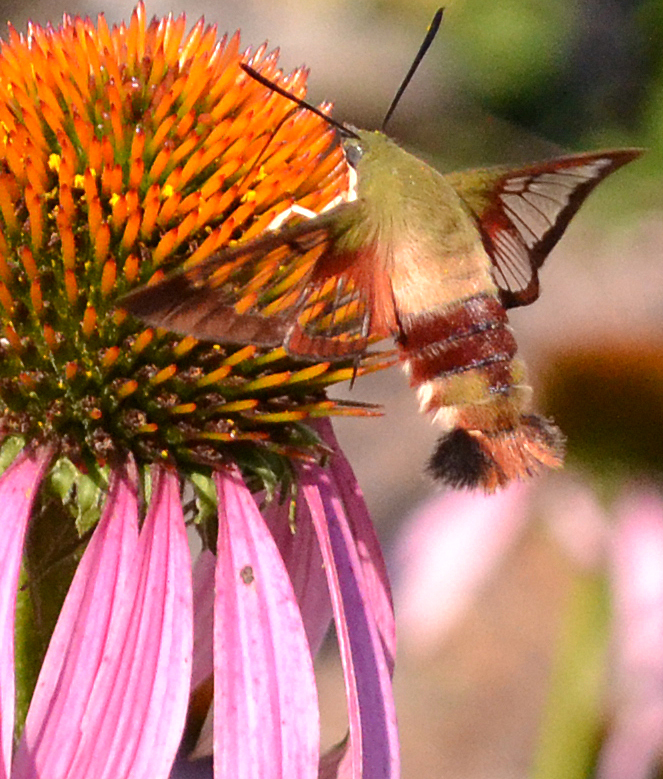 At right is a hummingbird moth, an amazing creature that I had never seen before. You’ll also see bees flying from flower to flower and dragonflies darting about. “Isn’t it great to see a garden that’s working?” she said. Colorful garden! I really like your photo of the hummingbird moth. Great capture, Connie. Here we go again! There is no such thing as an Amish fence anymore than there is a Catholic fence or a Protestant fence. It is a fence made by Amish or an Amish made fence. I have Amish cousins who take offense to this. I saw a hummingbird moth a few years back and was stymied by it until a friend told me what it was. So unusual. I am so sorry. I certainly didn’t mean to offend anyone. As you stated more clearly, the fence was made by Amish folks. It was fun taking photos of the hummingbird moths. They were larger than bees, they stayed in one spot for a relatively long period and there were lots of them. It increased my chances of coming away with something useful. Lovely flowers. I go by as often as possible during the growing season. I wonder when my garden not to far away will show signs of life again. Soon I hope. I can see daffodils in my garden. It won’t be that long until they’re blooming! Thanks for writing, Sharon. A beautiful garden…The fence is wonderful and not only affords protection but serves as a background for the flowers. So many people have great gardens. Thanks for sharing this one. fantastic garden, beautiful color arrangements.i’ll be stoppng by in the summer..
Beautiful garden. I am trying to slowly build up my garden – Where do you suggest I get good garden loam? Thanks, Catherine and Connie, for sharing. Whenever you’re looking for a product for your garden, I recommend starting with your local garden center. They have people who are trained in growing plants and want to make sure your plants will do well. If your local garden center doesn’t have a particular product, they will point you to someone who has what you need. 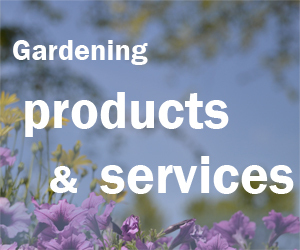 If you don’t know of good garden centers, take a look at the ads on our website. Click on an ad and you’ll be taken to that business’s website to see all of their products and services. Thanks for your question! Your garden is gorgeous. Does Clarence have a garden walk? We have hummingbird moths in our garden, also. They are great fun to watch and seem to like the same flowers as hummingbirds. Your picture is wonderful. 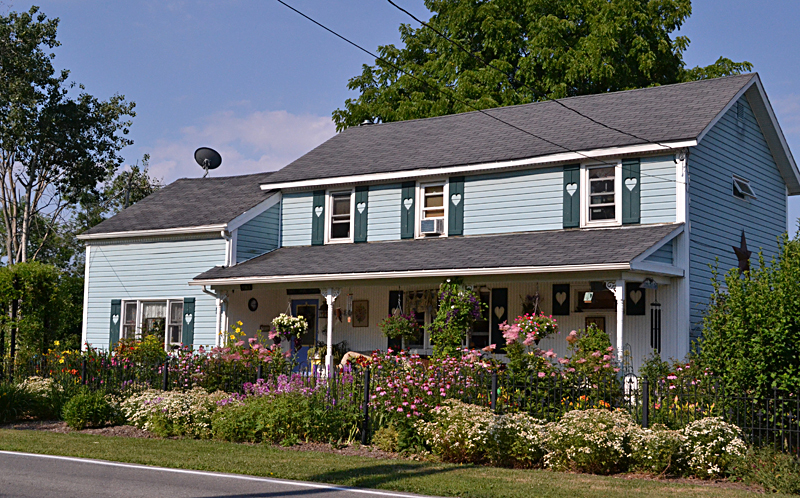 Clarence has Bikes in Bloom competition and a wonderful periennial sale on Sat.,May 18th. I saw this garden two years ago on the Clarence Garden Walk — they had to cancel the garden walk in Summer 2012 due to some kind of road construction. Anyway, your pictures really do show how beautiful it is. Great job. Also I love her Bear’s Britches so much I procured one later in the season. Mine is also fabulous. I recommend them to anyone. Make nice dried flowers too. Kirsten, thanks for all your great information this week! Please send me your e-mails. I belong to Kenmore Garden club and would love to receive your e-mails. A friend forward this to me. Lila, thanks so much for your interest. I have added you to our email list. Please tell your gardening friends! Beautiful. Any beautiful gardens in Cheektowaga? Any garden clubs in Cheektowaga? There are definitely beautiful gardens in Cheektowaga! You can visit them during the Snyder-CleveHill Garden View on July 14, 2013. 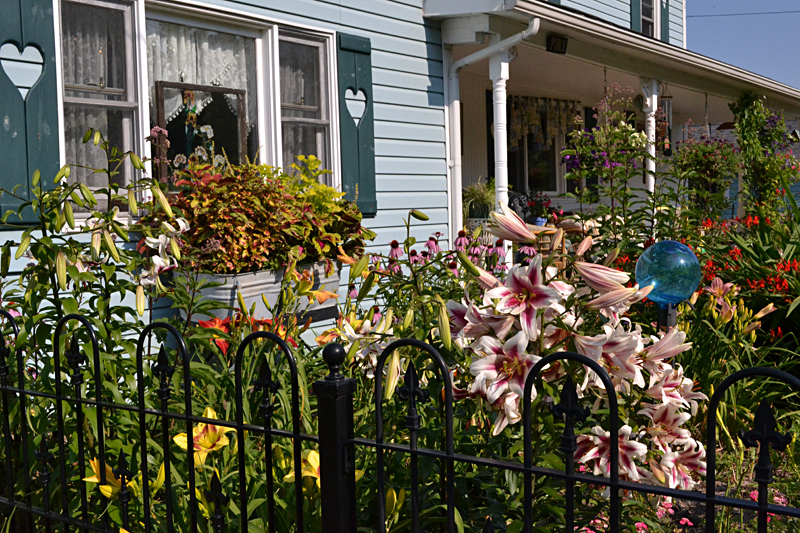 Here’s a story about a beautiful Cheektowaga garden from last year’s walk. 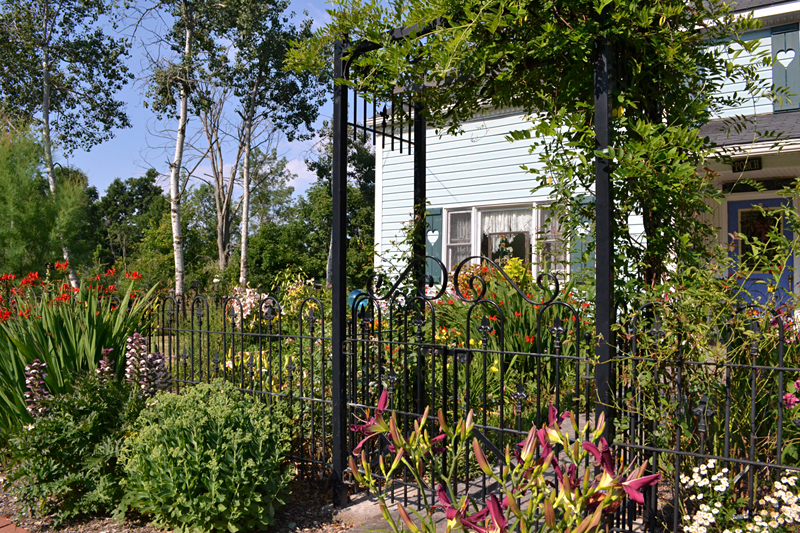 There is a Cheektowaga Garden Club and several others that might be near you. You can find details about them on the website of the Eighth District of Garden Clubs. There is also the South Town Garden Club, which is meeting just a couple hours from now as I write this. They don’t have a website, but for more information, you can call 668-0209. I list information on meetings and any other events that are open to the public on my Upcoming Events Page whenever the clubs send it to me. Thanks for your question!